Happy St. Andrew's Day! Not the golf course. This St. Andrew's is a holiday, Scotland's national day. Turner Classic Movies is celebrating St. Andrew's Day by offering a line-up of movies with connections to Scotland, with Wee Geordie, about a Scots boy who competes in the Melbourne Olympics, a comedy directed by Alexander Mackendrick called either High and Dry or The Maggie, something called Cruise of the Zaca, then The Master of Ballantrae, and, of course, Brigadoon, the one everybody thinks of first when they think "Scottish movie." But the really special movie on the schedule is Local Hero, a lovely little piece from 1983 written and directed by Bill Forsyth. 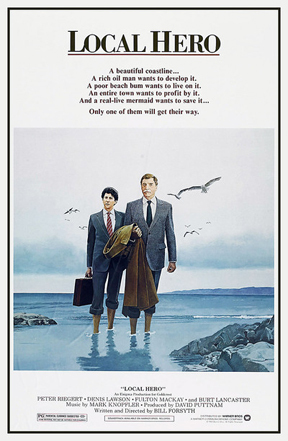 It stars Peter Riegert as an American businessman sent to a small fishing village on the coast of Scotland by his tycoon boss, played by Burt Lancaster. Riegert's character, called Mac, is supposed to be securing land to provide a base for Lancaster's company to drill for oil in the North Sea. Most of the locals are happy to help out, their eyes on the money Mac is offering, but one cranky old gent who lives in a shack presents an obstacle. And, as they say, complications ensue as Mac stays on in Ferness. Eventually the boss flies in to see what the delay is all about, adding to Mac's problems. Denis Lawson, Fulton Mckay and Peter Capaldi are part of the citizenry, as is Jenny Seagrove as a young woman named Marina who may or may not be a mermaid. That mystery about the mermaid gives you a hint of the movie's off-beat humor and charm. It's not so much about a fish out of water, a brash American at sea in Scotland, but a story about a fairly good guy who discovers that he may not want what he thought he wanted, that there may be things in life he hasn't been paying attention to in his climb to the top. Local Hero is a terrific movie, small but mighty, not unlike Comfort and Joy, another gem from Bill Forsyth. I don't know what's happened to Forsyth since he stopped making movies somewhere around 1999, but I wish he'd done more. There's nobody like him. And there's nothing like Local Hero. The scenery is gorgeous, Mark Knopfler's score is wonderful, and Forsyth's script and direction bring out the best in Reigert, Lancaster and Lawson. TCM hasn't made it easy to see -- it's scheduled for 2:45 am Central time -- but you can always set your DVR, right? Local Hero is so worth it. As awards season begins, Oscar contenders like Three Billboards Outside Ebbing, Missouri get wider releases to reach bigger audiences. If you've been waiting for this one, it opens tomorrow, November 30, in Bloomington-Normal at the Wehrenberg Cinema, if you want the cushy seat experience, or December 1 at The Art in Champaign, if you prefer a more intimate theater. It's been getting lots of Oscar buzz, and not just for Frances McDormand's fierce performance as a hard-scrabble mother pushing to find justice for her daughter, who was raped and murdered outside their town. The movie itself, plus Martin McDonagh's screenplay and direction and Sam Rockwell's performance as a racist, messed-up cop, are also showing up on awards shortlists and predictions. So far, Three Billboards has three nominations for Film Independent Spirit Awards -- Best Female Lead for McDormand, Best Supporting Male for Rockwell and Best Screenplay for McDonagh -- with awards at a score of international film festivals and 11 nominations and two wins at the British Independent Film Awards. You may know McDonagh as a playwright, with major work like The Beauty Queen of Leenane and The Pillowman to his credit, or as a screenwriter and director of films like In Bruges. Violence, meanness, small towns and a streak of humor laced with cruelty show up frequently in his darkly cynical writing. They're certainly a part of Three Billboards, with critics talking about the rage and pain that fuel McDormand's role and the film as a whole. For RogerEbert.com, Brian Tallerico calls Three Billboards "one of those truly rare films that feels both profound and grounded; inspirational without ever manipulatively trying to be so. Very few recent movies have made me laugh and cry in equal measure as much as this one. Very few films recently are this good," while Ann Hornaday of the Washington Post notes its timeliness, "when sexism in its most virulent forms has been revealed in a daily drumbeat of stories recounting unspeakable exploitation and abuse." 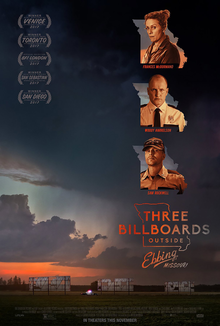 She concludes: "Three Billboards Outside Ebbing, Missouri is as dark as they come, a pitch-black, often laceratingly funny look at human nature at its most nasty, brutish and dimwitted." And if you're keeping an Oscar scorecard, you'll definitely want to check off Three Billboards. Dunkirk and The Post may be ahead of it in the Best Picture race, but McDormand and Rockwell are starting to climb in their categories. Don't count out that screenplay, either. Do you need a little Christmas, right this very minute? 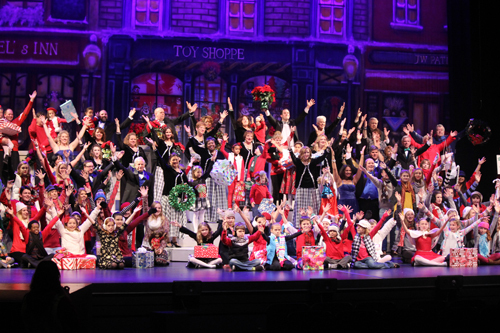 The Pantagraph's Holiday Spectacular, which features "[b]eautiful singing, hundreds of sparkly costumes, laughter and tears and lots of heart," returns to the Bloomington Center for the Performing Arts on December 1, 2 and 3. 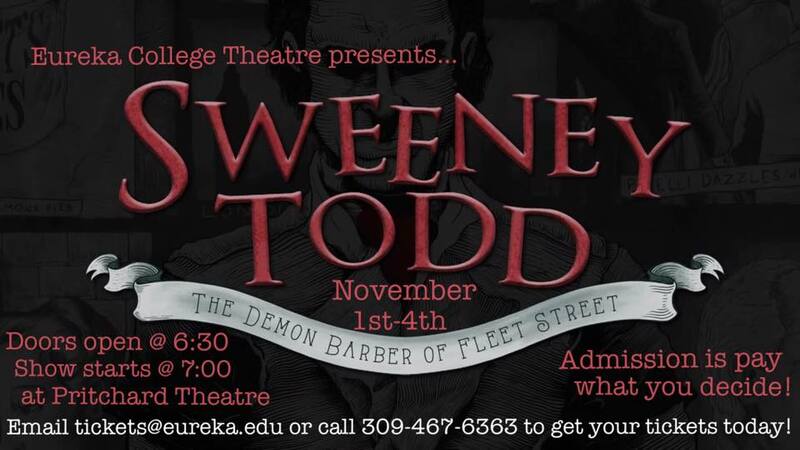 The Friday performance begins at 7:30 pm, with 2 pm matinees on Saturday and Sunday. 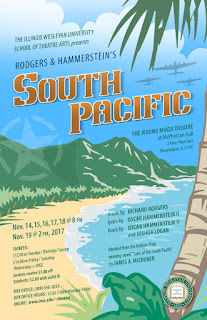 As in years past, Illinois State University professor Lori Adams directs this Holiday-palozza of entertainment, with Michael Schneider and Angela Bargmann as musical directors and Stacy Terry and Janet Hayslip as choreographers. Nancy Steele Brokaw has once again written the story for the musical and Marcia Basolo is back for her 16th year as executive producer. We are assured that many audience favorites -- from "precision-dancing Toy Soldiers" to an "enormous all-cast Santa medley" and "mass choir Nativity" -- will be back, with new features to keep the production fresh. The cast includes four actors (Kevin Alleman, Ed Campbell, Jennifer Rusk, Paul Vellella and Michelle Vought), an adult ensemble about 40 members strong, 50 children performers ranging in age from kindergarten to 8th grade, another 18 high schoolers, seven father/daughter teams, eight "Dobski dancers," 16 Wooden Soldiers, ten tappers, and a coterie of other groups who'll perform the opening number, a Frosty Follies, Christmas Wishes and Christmas Day numbers, an Ugly Sweater song, elves and reindeer dances and solos, a piece just for "Mr. Santa" and a Santa Claus Parade with ballerinas. 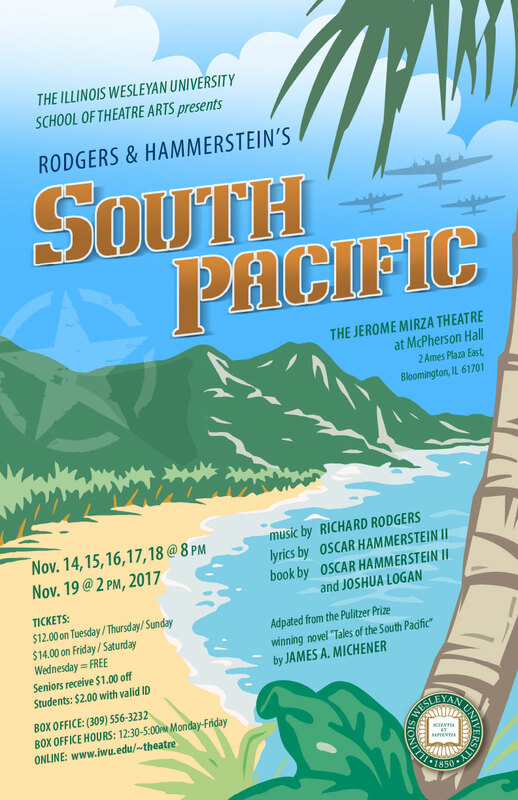 You can get tickets in person at the Bloomington Center for the Performing Arts box office, by phone (with an added charge) at 309-434-2777, or online at the BCPA website. When Sholem Asch's play The God of Vengeance opened on Broadway in 1923 -- in English for the first time after many performances across Europe in Yiddish -- the entire cast was arrested on charges of indecency. Why? Asch's story centered on a Polish Jewish man named Yekel*, conflicted by issues of faith as he kept a brothel on the floors beneath his family apartment. But the real kicker, the reason prominent actors like Morris Carnovsky and Sam Jaffe got hauled down to the pokey, was the lesbian part of the story. Asch wrote Yekel's daughter falling in love with a young prostitute from downstairs, including a beautiful and tender scene in the rain ending in a kiss between the two women. And that was simply too much for the authorities. 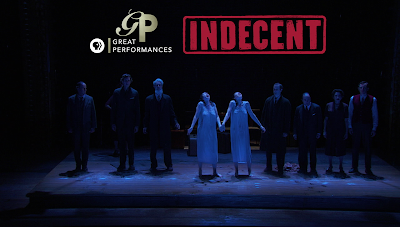 Playwright Paula Vogel took up the story surrounding Asch and The God of Vengeance in Indecent, a poetic and powerful play that marked Vogel's first Broadway production. That's remarkable in itself, that it that long to get to Broadway for someone like Paula Vogel, with a Pulitzer Prize for Drama to her credit for How I Learned to Drive, an Obie for The Baltimore Waltz, a pile of other awards and honors, and an illustrious career teaching playwriting (and chairing the department) at the Yale School of Drama. Indecent ran for 128 performances at the Cort Theatre, closing August 6, 2017, with Tony Awards for director Rebecca Taichman and lighting designer Christopher Akerlind, and Tony and Drama Desk nominations for the play itself. Part of what Indecent deals with is the ephemeral nature of theater. In a beautiful image in Taichman's production, the Vengeance actors show us how they and their play turned to ashes, lost in the Holocaust after they returned to Poland. But Indecent is also about the echoes that remained after the production of The God of Vengeance was physically gone. After all, Indecent reminds us that the play did change the lives of the people involved in it, especially the narrator in the piece, a stage manager named Lemml, who continues to tell us exactly that. The God of Vengeance and its kiss in the rain did imprint itself on the audiences who saw it, and it has even been performed again in Yiddish. Luckily for all of us, a performance of the Broadway production of Indecent was filmed last August so that it could be shared and replayed. 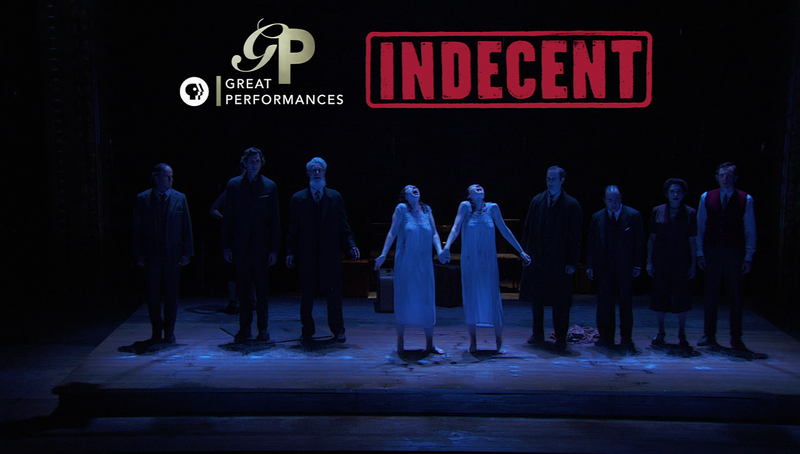 Indecent was broadcast last Friday in the regular Great Performances slot on PBS stations, but it is also streaming right now and there are reports it will also be available on BroadwayHD.com early next year. I feared Indecent might lose some of its intimacy or its power on the small screen, but it translates beautifully. Central performances from Richard Topol as Lemml and Katrina Lenk and Adina Verson as the two women in the rain are especially strong and especially moving. Mimi Lieber, Max Gordon Moore, Tom Nelis and Steven Rattazzi play many roles, creating a seamless ensemble that brings impressionistic scenes from Vengeance and the larger picture of Indecent to life. Taichman's staging makes the most of music by Lisa Gutkin and Adam Halva, which sets the tone as it adds joy and energy, while projections designed by Tal Yarden contribute a Brechtian note to the theatrical proceedings. A nod to the Yiddish culture that informed Asch's Vengeance and the major culture clash that arose when the Eastern European Jewish immigrants got to New York comes off both poignant and timely. On stage or on screen, Indecent is lovely, with a depth and tenderness that makes it unforgettable. *The character has also been called Yankl or Yankel. 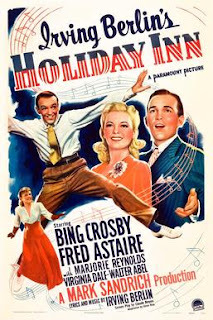 The Fred Astaire/Bing Crosby film musical Holiday Inn is generally considered a Christmas movie, probably because it's the place where Irving Berlin introduced (and won an Oscar for) the song "White Christmas." As a result, the 1942 Holiday Inn invariably shows up on television and in art-house and vintage movie theaters as part of their end-of-the-year schedules, even though in reality the movie covers all the holidays. You can see the 4th of July spirit in the poster at left. In the film, Bing plays a singer ("I'll Capture Your Heart Singing") who wants out of his competitive show biz partnership with Fred Astaire (he's the one who captures your heart dancing, naturally). Bing decides to retreat to the country and live on a farm. Then he has the idea to turn the farm into an inn (Holiday Inn, naturally) where he can perform only on holidays. He'll loaf the rest of the time, but put on a show for Thanksgiving, Christmas, New Year's Eve, Lincoln's Birthday, Valentine's Day, Washington's Birthday, Easter... Basically whichever holidays Irving Berlin was inspired to write songs for. The plot hangs on those holidays, as Bing gets a romance in the form of Marjorie Reynolds, ex-partner Fred pops up at the Inn at an inconvenient time, their rivalry rekindles, and each gets the chance to shine in multiple numbers. 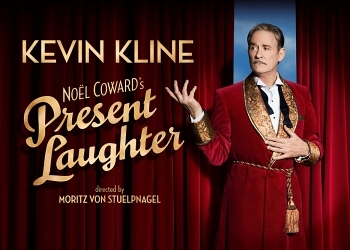 The movie came out in 1942, but didn't get translated into a Broadway show until 2016. The Broadway version imported Irving Berlin hits like "Blue Skies" and "Cheek to Cheek" from other Astaire and Crosby vehicles and thankfully took out "Abraham," which was performed with blackface in the movie, but the basic plot idea with its singer/dancer rivalry over romance and the inn in the country is still there. On Broadway, Bryce Pinkham took the Crosby role, while Corbin Bleu tapped into Astaire's shoes. Yes, that sounds a lot less starry, but they compensated with big production numbers and a whole lot of splashy costumes and sets in eye-popping colors. 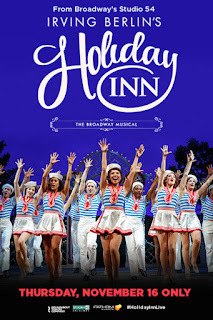 If you'd like to see for yourself, a performance of that Broadway version has been filmed to show on movie screens as well as through PBS Great Performances and its Friday-night Broadway's Best series. 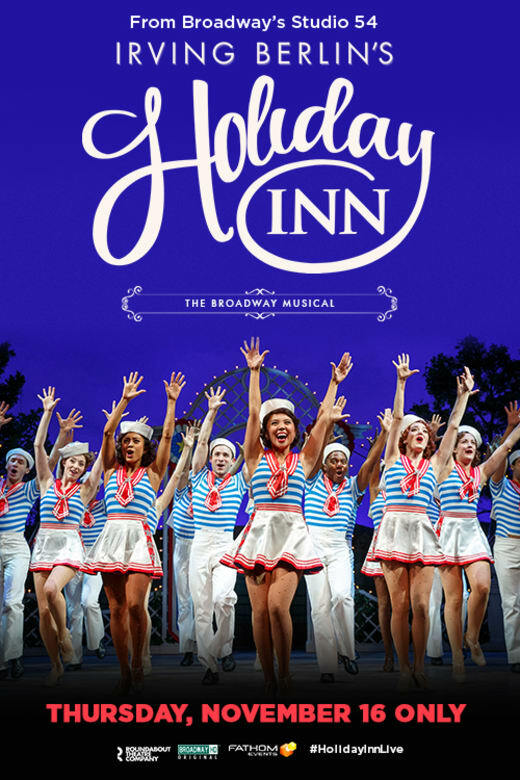 Tonight is the night for the Broadway Holiday Inn on big screens as a Fathom Event. Around here, you have the option of 7:30 pm screenings at Willow Knolls 14 in Peoria, Savoy 16 outside Urbana, or Springfield 12. If that doesn't work in your schedule, never fear. PBS has your back. They'll be showing the same Holiday Inn on the small screen, which you can watch in the privacy of your own home, on Friday, November 24, at 8 pm Central time. After that, you can expect it to stream at pbs.org on this Episodes page. And if you are more into Bing and Fred and the original Holiday Inn, the Normal Theater will show the 1942 film on that same Friday, November 24, at 10 pm, as well as Sunday, November 26, at 1 pm. Or, if you want to see Bing and Fred on your own telly, Turner Classic Movies has a January 1, 2018 option at 7:30 am Central time. That means you can see the boffo technicolor Broadway show and the classic black-and-white movie, both on the big screen or the small screen, and compare/contrast to your heart's content. To recap, for a screening of the Broadway Holiday Inn, you can get to a movie theater tonight (November 16) or watch on TV a week from tomorrow (November 24) or stream it online after that, or see the classic movie later that night (November 24) or the following Sunday (November 26) or set your DVR for the first morning of the new year (January 1). So much Holiday Inn! Three Tall Women, Edward Albee's Pulitzer Prize-winning 1994 play about three stages of life, opens tonight at Heartland Theatre with a "pay what you can" preview performance beginning at 7:30 pm. This acerbic exploration of aging, mortality and disappointment is considered autobiographical for Albee, springing from his relationship with his mother. To work through his issues, he's written his play around women called A, B and C, representing old age (A is 92 at the outset), middle age (B is 52) and youth (C is 26). 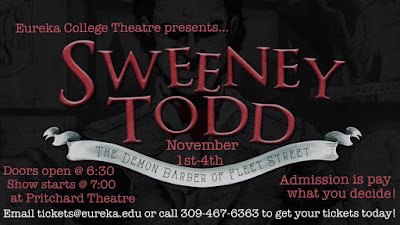 In Act I, they are a wealthy, bitter, imperious woman, her caretaker and a representative from her lawyer's office, but in Act II, their characters shift a bit, showing how much they have in common as they progress through important chapters in their lives. Albee himself directed the first production of Three Tall Women in Vienna in 1991. Since then, it's been produced off-Broadway and in London, with a new production starring Glenda Jackson, Laurie Metcalf and Alison Pill and directed by Joe Mantello set for Broadway next spring. Heartland Theatre artistic director Rhys Lovell is directing their production, which runs through November 18. His A, B and C are Lynda Rettick, Devon Lovell and Emilia Dvorak, with Daniel Job in the non-speaking role of the Boy.